4 pages from Legion Lost #0. Timber Wolf's secret origin. ComicBookResources has the new title, as Nathan Dayspring Summers returns to action, and has his own squad behind him again. Most of us will not be happy about it. ComicBookResources has the article featuring alternate covers for the upcoming Avenger titles. Now I know that AvX (and the Consequences) has left us all a little ragged and sour, but here are some images that may add a spoon full of sugar for your Friday. 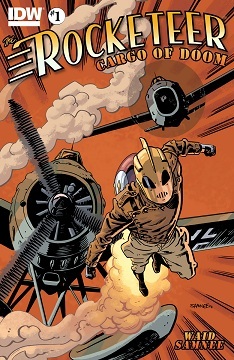 Four pages each from issues 1 and 2 of ROCKETEER: THE CARGO OF DOOM, the Rocketeer mini-series currently being put out by IDW. It's by Mark Waid (2012 Eisner winner for Best Writer) and Chris Samnee (2012 Eisner nominee for Best Penciller), the same creative team currently doing DAREDEVIL.